Friends! With the growth of this little blog comes new opportunities. And that includes you and your creative business, blog or shop! 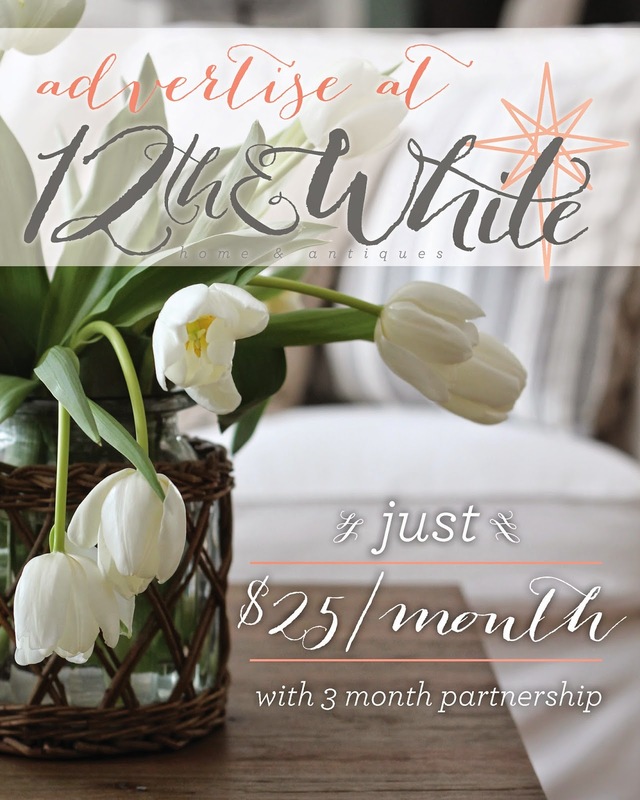 I am now accepting sponsors at an introductory rate of just $25/month! Since I'm a small business owner, I love connecting with other creative businesses and helping them succeed. This blogging community (specifically the home decor niche) is such an incredible thing to be a part of. I would love to partner with any of you who blog, have an etsy shop or business, or just want to connect others to your corner of the world. What kind of exposure would you get through advertising at 12th & White? This blog is more than four years old with hundreds of regular readers, 15,000 page views/month, more than 1,000 Facebook fans, and 8,000 Pinterest followers. My work has been featured in Inspiration Vintage Magazine, on CountryLiving.com and on several other blogs. And you would be supporting this creative business while you're at it. I've always wanted to see if this blogging/decorating/antiquing thing could turn into a full-time adventure, and this is another step in making that dream a reality. Sponsor ads will appear in the sidebar of the blog beginning August 1. You will also receive a feature in a post at the start of your sponsorship. If you're interested in becoming a sponsor, I'd love to hear from you! Just email me at courtneymbrowning (at) gmail (dot) com. Here's to dreamers, creators and entrepreneurs! I love the attic view and all your pictures. I will be back to look again and again!